I did this for my trip to Orlando, a few months ago, I love pink and when I was growing up (in Florida) I was always amazed at the beauty of these birds. 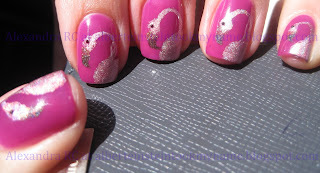 I love nail art, and once in a blue moon I do it with lots of patience. I wish I had more time to do it. Beautiful - I really loved this when I saw it as your profile pic. That Make Up Store holo is beautiful. 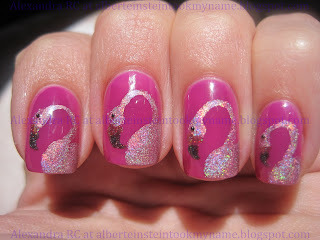 You do fantastic nail art, you should do more! This is pretty freakin' amazing! 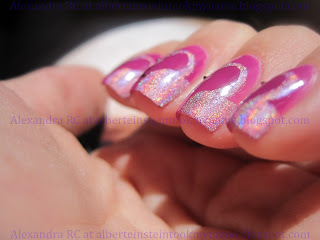 How creative to do them w/ holo. Oh, my God. This is absolutely STUNNING! I am in awe. WOW! This design is amazingly beautiful! !